Guess what, teamTEEN author fans? It’s Dare Day again! I know I said that last week, but apparently I jumped the gun a bit. Whoops. But the good news is, this week, you can enter to win books & stuff! To check out all of the fabulous PRIZES, just go to the TeamTEEN Author Dare Day Contest, read the rules, enter the contest, & you may just get lucky. And if you like seeing authors make fools of themselves, check out these Dare Day posts from other TeamTEEN Authors. And now, I present to you, my biggest teen celebrity crush. My Celebrity Crush Likes Richard Nixon! I guess I’m a bit of a pragmatist when it comes to love. Sure, I had my share of teen crushes, but always on boys I actually knew, boys who were, at least theoretically, within my grasp. Unlike my pre-teen friends, I never understood the thrill in pressing my lips to the pages of Tiger Beat Magazine. Probably because I had the good sense to realize that there was no way in hell Leif Garret or Shaun Cassidy would choose a nine-year-old as their girlfriend. And except for one naughty dream about Van Halen front-man David Lee Roth (which I blame entirely on my subconscious) the boys of my fantasies were always just regular ol’ dudes. And then I saw Michael J. Fox. For the record, I also had a girl-crush on Justine Bateman. Never mind that he was 5’2” and, in all likelihood, weighed less than me. 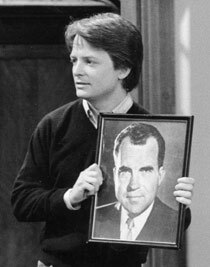 Or that his character on FAMILY TIES was a rabid Republican. Then BACK TO THE FUTURE came out, and my infatuation swelled to proportions not even a flux capacitor could measure. Wait a minute, Doc. 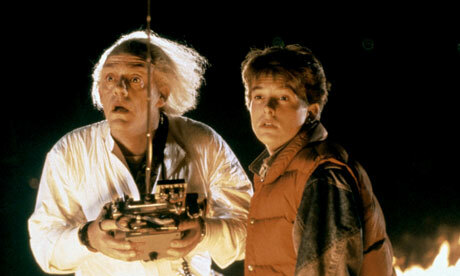 Are you telling me that you built a time machine… out of a DeLorean? By the time I went to Japan for the summer as an exchange student, I’d created a well-worn collection of romantic MJF fantasies to keep me company whenever I felt lonely. Which was a lot. These often played to the soundtrack of Paul Simon’s Graceland—one of the few cassette tapes I’d brought with me on my trip. Thinking about that time in my life brings up fond memories. And as a tribute to my former crush, I’m going to go donate to his charity for Parkinson’s Disease right now. Guess what, teamTEEN author fans? it’s Dare Day again! Oh yes, I already completed my qualifying dare last March (see below). But I’ve never been one to turn down a chance to humiliate myself on the interwebs. And so, I present to you, my biggest celebrity crush.